Washington Harbour, also sometimes known as the Residences at Washington Harbour, is a very high-end condominium in Washington, DC’s posh Georgetown neighborhood. Like other waterfront properties in the District, these luxury condos for sale can come with some sticker shock, topping out around $6 million. 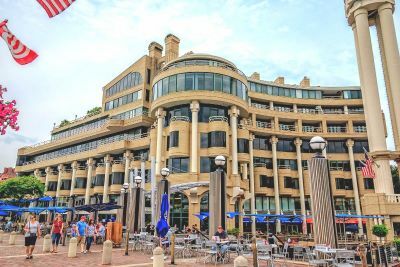 Delivered in 1984, Washington Harbour was designed by legendary architect Arthur Cotton Moore, a sixth-generation Washingtonian who also renovated the Library of Congress. The seven-story modern complex is home to 35 spacious residences with floorplans ranging from 1,750 to around 2,800 square feet. The mixed-use building also has ground floor retail, including restaurants with outdoor seating overlooking the adjacent Georgetown Harbor with its picturesque boat docks. The Residences at Washington Harbor are located at 3030 K Street, NW, between 31st Street and Thomas Jefferson Street. These classic city homes feature combinations of hardwood and marble floors, along with high ceilings and from one to three wood burning fireplaces per unit. You can add gourmet kitchens, formal dining rooms, luxurious baths and private outdoor spaces—perfect for viewing the waterfront. Some of the condos even have maid’s quarters. Residents of this pet-friendly building also enjoy a host of amenities, including staffed front desk, concierge service, parking, a business center, a fitness center and a rooftop swimming pool. Considered one of DC’s top destinations, Washington Harbour is more than condos for sale. Other key components include top restaurants like Fiola Mare, Farmers Fishers Bakers, Nick’s Riverside Grill, and Orange Anchor. There’s also a boardwalk, planned events, river cruises and DC’s largest outdoor ice rink, open from November to March. And you thought this was just another Washington condominium! For more information, call District Partners Real Estate, LLC, at 202-798-3600.